Whichever way you budget, there is a difference between buying meat in cost-per-serving as opposed to cost-per-kilo. This list shows you some quick and easy comparisons. Boneless and minced meats (flank, tenderloin, round, fillet, rump, lambs fry, heart, kidneys, brains, tongue, sausages etc.) will yield approximately 6-8 servings per kilo. If you take the half-way point (7 servings), just divide the cost of the meat per kilo by 7. Meat with a medium amount of bone (rib roasts, rump roasts, chuck, chops, steaks, ham slices, loin roasts and leg of lamb) will yield 4-6 servings per kilo. Again, take the price of the meat per kilo and divide it by 5. Meat with a large amount of bone (short ribs, neck, shank or shoulder cuts) generally gives 3-4 servings per kilo. Divide the cost of the meat per kilo by 3.5. It is very possible that although these cuts of meat may appear to be inexpensive when compared to other cuts on a per kilo basis, when you calculate the cost per serving, some of these cuts may be quite expensive. Smart shoppers use cost per serving rather than price per kilo in making meat selection decisions. Price per kilo can be misleading because all cuts will not yield the same number of servings per kilo. Although some boneless cuts may cost more on a per kilo basis, they may be more economical due to less waste. The amount of bone and waste fat determines the number of servings of cooked meat a cut will yield. Cost of the edible portion is really the important factor. 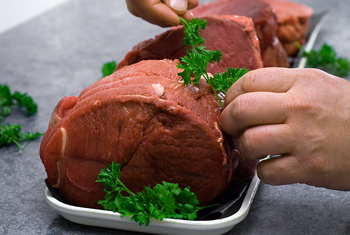 The type of cut you purchase is very important in determining the amount of meat to buy. Normally a recommended serving size is 90 – 100 grams, or about ten servings per kilo of cooked lean meat. The servings per kilo of purchased weight can vary greatly due to differences in fat and bone content of different retail cuts. For example, about twice as many people can be fed from boneless pork chops as from pork sirloin roast because boneless pork chops have about eight servings per kilo, compared to four - five servings per kilo for a pork roast.